Tammy365: are you appealing or a peeling? are you appealing or a peeling? Well.....hello! Did you take challenge #1 with me? Meet someone new and remember their name? I did! Last week, I had two new experiences. I met Krista who is the mother of my daughter's new friend Lauren. They own Raspberry Row in downtown Dalton. You might check it out sometime. I also went to a retirement party for an old friend that I had not seen in a while. There were about 50 people there I had never met and about 6 or 8 that I knew! I met a grand total of 3 new people out of that crowd and remember their names, Andrea, Geoff and Earlene! I think I passed the challenge, but, I woke up this morning wondering what makes people appeal to other people? What makes someone interested in talking to me? I can't think of one thing! At one point during the retirement party, Laura and I, (Laura is my friend I went with) were hugging a wall just watching all the other people talk and have fun. At this point, I started to discuss what makes people appealing and we could not answer the age old question. We moved to a table just outside of the "social" imaginary line and ate hors d'oeuvres. Food is always your friend and always appealing! When dinner began, Laura and I were rescued by four sweet, younger-than-us guys we knew and luckily, we didn't have to occupy a table for two old, boring women. 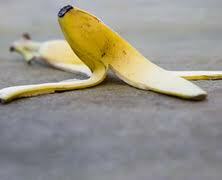 Yep, a banana peel! What can you do with a banana peel? Nothing! You can at least make jelly out of apple peelings! lol Wait a minute. My mom uses banana peels to fertilize her rose bushes. Now, that makes me feel better. I'm seeing a ray of sunshine. Yes, even a peeling, that you seemingly can't do anything with can be used. So, this day, if I can't be appealing, not just yet, I will be happy as a peeling that is used to fertilize someone else to make them grow. If I can see someone get stronger, grow larger, spread their roots, put on green leaves or bloom, I will be content with my progress, put one in the "win" column for Tammy. After all, isn't that what being a friend is about?